Hon. Imuodu Sule, the father of Apostle Johnson Suleiman of the Omega Fire Ministries has warned his son to desist from criticizing the All Progressive Congress and President Buhari. Apostle Suleiman is known for often criticising the government during his sermons, but this does not sit well with his father Hon. Sule, who is the current leader of APC in Auchi and also the APC Deputy Leader, Etsako West in Edo state. Speaking with journalists in Lagos on Wednesday. Sule reiterated his love for his son, but said he had been receiving calls from well-wishers who are “urging me to call my son to order”. He added that anyone who does not support Buhari is an "enemy of the nation". "This is a man I love, respect and hold in high esteem for being a person of integrity over the years," he said. "Each time I hear people criticize my party, the (APC), my heart bleeds. Apostle Johnson Suleiman who's my biological son and a renowned preacher of the gospel, is seemingly becoming a consistent critic of the ruling party lately." "And I am seriously concerned about it as numerous well-wishers are now urging me to call my son to order. 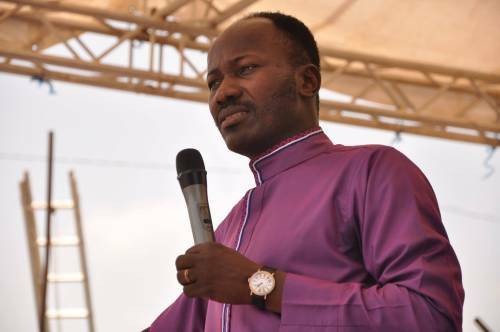 I hereby speak out to let Nigerians know that I have warned my son (Apostle Johnson Suleiman) to immediately leave politics for politicians and focus on his calling as a priest." "Being a retired army officer, President Buhari is my Commander-in-Chief and the overall leader of my party, the APC. Hence, I will do anything in my capacity as a stakeholder to support Mr. President for his noble re-positioning of our dear country Nigeria." "Consequently, anybody who is not supporting the administration of President Muhammadu Buhari is an enemy of the nation." Apostle Suleiman’s father said that he is speaking out now because his son did not honour the discussions they’ve had as father and son on the issue. He said his son had travelled out for his missionary work and for that reason he chose to speak out. It will be recalled that in Janaury 2017, Apostle Suleiman was invited by the Department of State Security (DSS) following an inciting statement by him against the state.